Delfino Mar, a seafood restaurant near the coast of Lima, makes me think of Boca Del Rio. That heavily touristed resort town outside the city of Veracruz was once nothing but dirt roads and a couple of wonderful, open-air seafood restaurants. Delfino Mar like is like those places—small, casual and breezy, looking oddly out of place tucked up against modern apartment buildings. 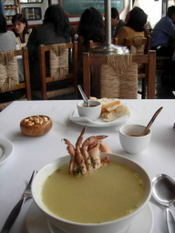 Like most of Lima’s seafood restaurants, it opens only for lunch, which continues to 5 p.m.
Each time I go, I order the same thing--ronda tres sabores, a plate of three classic Peruvian seafood dishes. These are tiradito, sliced raw senorita fish in a brilliant yellow sauce made with aji amarillo, a chile that is yellow (amarillo) in name only; causa, a silky potato mixture as yellow as the tiradito wrapped around crab, and, my favorite, octopus marinated with nutty- tasting olive oil and accompanied by tangy olive mayonnaise. Just as Veracruz has its vuelve a la vida (come back to life) seafood cocktail, Delfino Mar has caldo levanta muerto, raise the dead soup, a fish soup with a bony hand clawing at the bowl—just crab claws, nothing scary. Many Lima restaurants serve only roasted corn with drinks, but Delfino Mar provides bread to eat with a delicious warm tomato sauce that contains chopped squid and actopus. 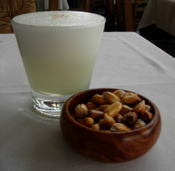 The pisco sours come either seco (dry) or demi seco (sweet). I’ve had a delightful lucuma mousse for dessert, set on a chocolate-mint base and striped with chocolate. But really, it’s the seafood that counts here. 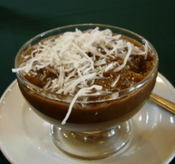 Delfino Mar, Jorge Chavez 509, Miraflores, Lima, Peru; Tel: 445-3470. Go to La Gloria if you want to dine with the swells of Lima. It’s a cozy place, not austere and imposing, as you might expect from an ambitious, high-ticket restaurant. The flowery menu lets you know the food is delicious rather than letting you judge for yourself. It’s smart to order from the seafood section, because Lima’s fresh seafood is so good. There are also meats, pasta, rice, salads and nightly specials. Grilled tuna perfumed with aromas of eucalyptus from the mountains intrigued me, but the description had more flavor than the fish. I simply couldn’t detect an aroma of eucalyptus. Nevertheless, the tuna was cooked just as I asked (termino medio, half cooked rather than raw). The salad on the side included only a shred or two of the promised grilled baby onions. The standout was the dessert, delicia de chirimoya, a pillar composed of crumbly, rich chocolate brownie topped with diced fresh cherimoya and capped with cherimoya foam. More fresh cherimoya and cherimoya sorbet were on the side along with spun sugar grillwork. 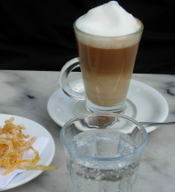 The butterscotch and pisco sauce sounded marvelous. Alas, it was confined to thin swirls on the plate, not enough to taste. But then chefly restraint is typical of restaurants of this caliber. La Gloria has a superb list of piscos by the glass, categorized by brand and grape variety. Huarangal’s quebranta pisco went into my pisco sour, which was the smallest I had during a week in Lima and thin tasting—the sweet and sour balance was off. Oh well, in pricey, top-of-the-line restaurants, less is more, but not when it comes to my pisco sour, thank you. La Gloria Restaurant, Calle Atahualpa 201, Miraflores, Lima, Peru. Tel: 445-5705. 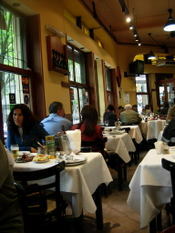 Tableconversation.com is heading to Lima, Peru to report on great places to eat there. The seafood restaurants alone are worth the trip. But there is much more, including buffet restaurants that present the vast range of Peruvian cuisine in a single meal, Chinese restaurants, which in Peru are called chifas; grilled chicken places on almost every corner and lively cafes. 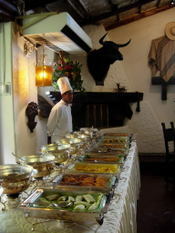 Then there is the 19th century tavern that serves Peruvian style bar food along with the national drink, pisco. It’s at one corner of a complex that houses the warehouse and sales counter of a top pisco producer, where you can pick up a bottle to take home—packed in your suitcase. Peru and Mexico have produced the two greatest cuisines of the New World, but Peruvian food is not as known as that of Mexico, because it doesn’t travel well. The enormous variety of fresh ingredients required for Peruvian dishes is only available there—a good reason to visit the country. 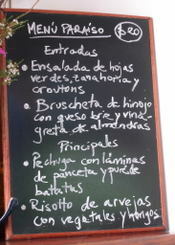 Then on to Buenos Aires for more wining and dining in a city that really knows how to live the good life. www.tableconversation.com will resume after a three-week pause for travel.